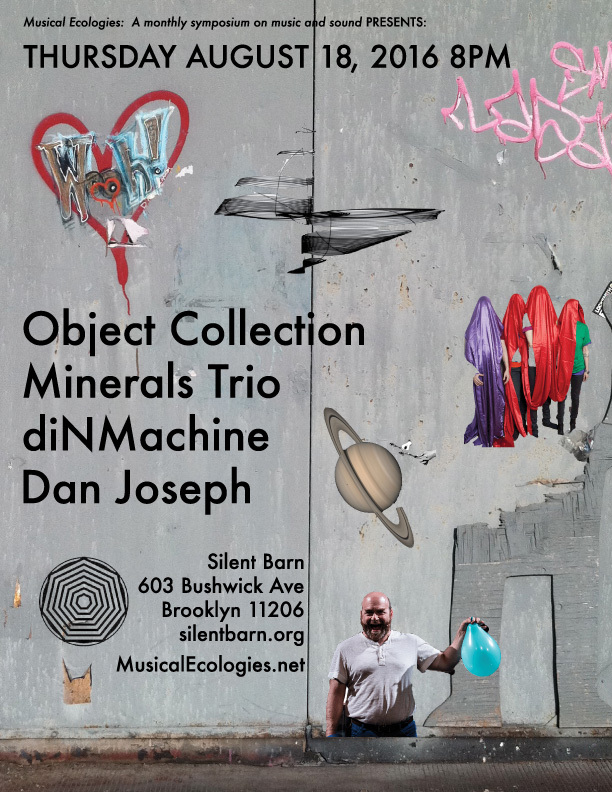 Musical Ecologies, the monthly series in Park Slope, Brooklyn, presents a special summer session featuring Object Collection, Minerals Trio, diNMachine and Dan Joseph. Each of the four sets feature artists previously presented on Musical Ecologies which is currently on summer break, and presents an opportunity to revisit some of the series highlights in the alternate universe of Bushwick, Brooklyn. 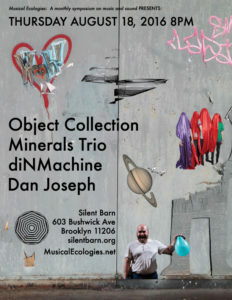 Musical Ecologies is a monthly symposium on music and sound held every 2nd Thursday (except where noted) at the Old Stone House in Park Slope, Brooklyn. Curated and hosted by composer Dan Joseph, each event typically focuses on a single artist who presents a work or project either in the form of a talk or lecture, a multimedia presentation, a performance, or combination thereof. Object Collection was founded in 2004 by writer/director Kara Feely and composer/musician Travis Just. Based in Brooklyn, the group operates within the intersecting practices of performance, experimental music and theater. The group will perform a mashup of two recent works, and cheap&easy with Taylor Levine (guitar), Andie Springer (violin), Owen Weaver (drums), Just and others. Minerals was started by Zach Layton (guitar) and Bradford Reed (drums) in 2009. The project is an ongoing exploration of their mutual obsessions with metric phasing, modular improvisation, resonant states of consciousness, alternate tuning systems and rhythmic hypnosis. Erdem Helvakioglu (laptop) modulates and remixes the group through real-time signal processing, using live input from the percussion and guitar. Led by Michael Schumacher (electronics) and Nisi Jacobs (bass), diNMachine creates amoebic electro-rock that fuses Indian, African & South American styles with jazz and avant-garde, set upon a bed of field recordings, drones and an urban sensibility. Their latest album The Opposites of Unity is now available from Greedy Dilettante Records. Dan Joseph is a composer, writer and curator based in New York City. In his solo performances on electroacoustic hammer dulcimer, he constructs slowly unfolding contemplative soundscapes with roots in early minimalism, ambient music and acoustic ecology. Applying a mix of traditional and experimental instrumental hammer dulcimer techniques in combination with electronics, Dan gives this ancient instrument an entirely new and contemporary identity. Upcoming: SUMMER BREAK. Season Five begins Thursday September 8th. Comments closed — Trackbacks closed RSS 2.0 feed for these comments This entry (permalink) was posted on Monday, July 11, 2016, at 3:10 pm by Dan Joseph. Filed in press release.